GOOD AS NEW – GUARANTEED ! Fantastic value for money, these are original ASHTON heavy duty machines, usually taken back in part-exchange by customers upgrading to automatic arrissing/seaming lines. All parts are thoroughly checked and replaced with new parts where needed. The main machine chassis is usually shot blasted back to bare metal and treated to a completely new powder-paint finish. Electrics and guarding all brought up to current CE standards, thoroughly checked, and the machines are sold with a full 6 month manufacturer’s warranty. 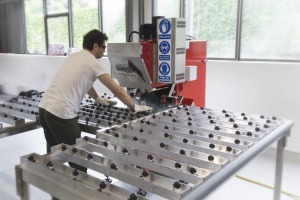 All machines are guaranteed functionally perfect and, with normal maintenance are expected to deliver reliable top quality processing for at least another 10 years. * Price subject to VAT on inland sales. No VAT on exports. Packing, insurance and freight will be quoted according to destination. Does not include diamond grinding belts. 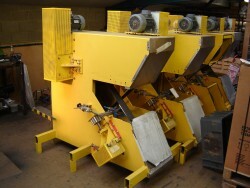 Supplied with 1 pair SIC grinding belts included free. Installation is simple, but if you prefer the services of an ASHTON technician to set the machine in operation for you, we will be happy to quote. A truly exceptional example of a fully factory rebuilt UNIX wet arrissing/seaming machine, barely distinguishable from an entirely new one. 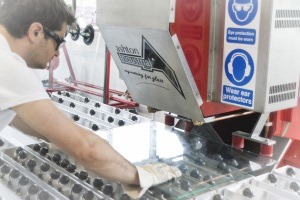 TABLE extensions can be provided if larger glass sizes are to be processed. It is pictured here at its current location in the Dubai showroom of our Middle East representative following the recent Gulf Glass exhibition, from where it can be shipped anywhere in the world. Shipping cost according to destination.